« Bright Futures Cafe Inspires Middle Level Leadership! From Education Evolving, ” … learners have a meaningful role in planning learning activities and are allowed to choose the manner by which they demonstrate proficiency. The chart below demonstrates the many connections between theses two documents. If you click on the chart you can make it bigger. Middle school teams (the original professional learning communities), advocacy programs, and the allied arts are the perfect vehicles for personalizing or customizing learning in a proficiency/standards based curriculum because of (1) the emphasis on knowing the whole child well in order to structure instruction to meet specific learning needs and (2) opportunities for students to learn in different contexts. These organizational features of effective middle schools must not be overlooked as schools implement new initiatives. Also, there is a lot of collective knowledge hidden among more senior staff members who started teaching in the 1970’s and 80’s. They know about student choice in demonstrating knowledge, they understand how to build an integrated unit, they’ve experimented with project based learning, they have strategies for teaching students to delve deeply into text to ferret out evidence to support an argument–they just had to bury those skills during the era of NCLB. Think about ways to liberate that vast wealth of experience and connect it with the techno-wizardry of young staff members. 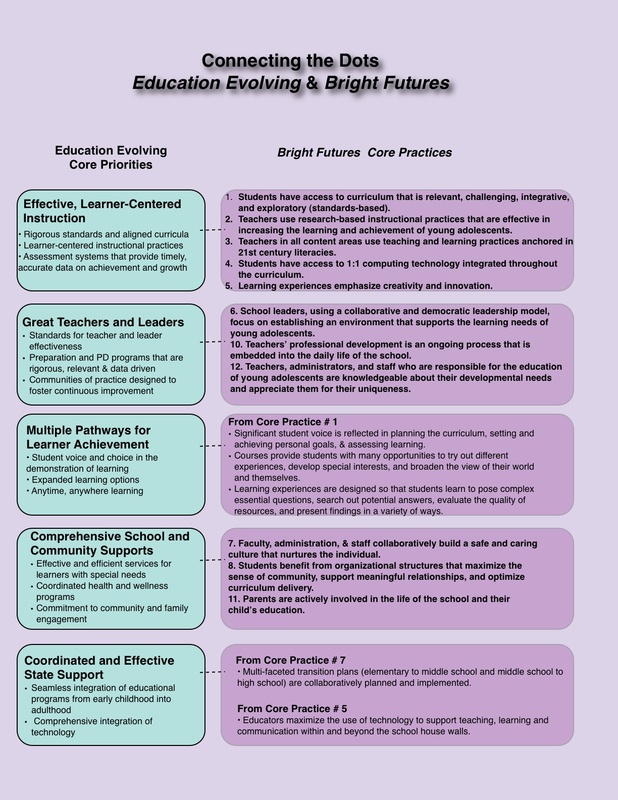 The 12 Core Practices of the Bright Futures report will help you evolve as an effective middle grades school. Evolving Education, the Common Core, and proficiency-based learning will be interesting challenges to solve together rather than insurmountable hurdles that keep you from moving forward. This entry was posted on July 21, 2012 at 6:22 pm and is filed under Customized Learning, Food for Thought, School Reform. You can follow any responses to this entry through the RSS 2.0 feed. You can leave a response, or trackback from your own site.